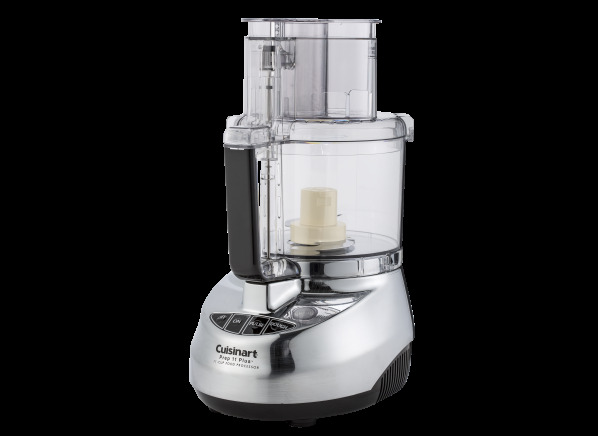 The Cuisinart Prep 11 Plus DLC-2011CHBY is part of the Food processor & chopper test program at Consumer Reports. In our lab tests, Food processor & chopper models like the Prep 11 Plus DLC-2011CHBY are rated on multiple criteria, such as those listed below. Claimed capacity: Capacity of processors is as claimed by the manufacturer. Weight: Weight of processors, rounded to the nearest pound, includes the base, bowl, lid, and chopping blade. Chopping: We judged each model's proficiency at chopping onions, and almonds. Separate shredding blade Separate shredding blade Whether the processor has a separate shredding blade that can be reversible or singular. Separate slicing blade Separate slicing blade Whether the processor has a separate slicing blade that can be adjustable, reversible or singular. Reversible Shredding/Slicing Blade Reversible Shredding/Slicing Blade Whether the processor has a reversible blade which includes both a shredding and slicing blade. Dough blade Dough blade Whether the processor has a dough blade for kneading bread. Whipping attachment Whipping attachment Used to whip eggs or cream. Minibowl insert Minibowl insert Whether the unit has a small bowl with its own blade that fits into the larger bowl of the processor. Useful for chopping up small quantities (e.g., garlic). Disk carrier/organizer Disk carrier/organizer Organizes extra blades and disks into a neat carrier. Juicer attachment Juicer attachment A reamer that juices citrus fruits like lemons, oranges etc. Additional features Additional features Any additional accessories or features that come with the unit. Controls Controls Indicates the type of controls the food processor has. Speeds Speeds How many speeds the food processor has. Wattage Wattage How many watts each food processor is. Some were converted from horse power or amps to watts. Warranty (yrs.) Warranty How long the manufacturers' warranty is for other parts of the food processor except the motor. Motor warranty (yrs.) Motor warranty How many years the manufacturers' motor warranty is.